"I used to believe in forever, but forever's too good to be true." "Once, upon the last day of a golden summer, there was a boy... and a bear. The boy, who we shall meet in a moment, was called Christopher Robin. The bear was called Winnie the Pooh. And together, they had many grand adventures in a remarkable place called the Hundred Acre Wood. But the grandest and most extraordinary of all those adventures was still to begin..."
Pooh's Grand Adventure: The Search For Christopher Robin, in some countries titled Winnie-the-Pooh's Most Grand Adventure, is a 1997 direct-to-video film in the Winnie-the-Pooh franchise about Pooh and company searching for Christopher Robin. Christopher Robin spends the "last day of a golden summer" with his best friend, Winnie the Pooh, all the while keeping a secret from him. He leaves Pooh with some cryptic advice: "You're braver than you believe, stronger than you seem, and smarter than you think... Even when we're apart, I'll always be with you." Pooh's Grand Adventure is considerably Darker and Edgier than past stories in the franchise. Though most previous Pooh stories would feature moments of drama, this is more drama than most standard Pooh fare note Death is even touched on here, even if it's just a Disney Death. It's also the first Big Damn Movie of the franchise. Some of the movie's settings, as well as the movie's main theme, would later be adapted into Kingdom Hearts II. The '90s: Mostly unseen, but "Wherever You Are" does get a '90s pop ballad remix during the end credits (which is far more tearjerking and heart-wrenching than you'd expect to be featured in the credits for a DTV Pooh movie). Absentee Actor: Kanga, Roo, and Gopher are nowhere to be seen in this film. Christopher Robin: "You're braver than you believe, stronger than you seem, and smarter than you think." Aside Glance: Many of the characters look at the fourth wall at several points (such as Rabbit being annoyed when Pooh can't read Christopher Robin's note). Award-Bait Song: "Wherever You Are," although sung by Pooh in the movie, gets its Award Baity remix over the end credits performed Barry Coffing & Vonda Shepard. Balloonacy: Not balloons, but apparently Piglet and Pooh can be carried through the air supported by a handful of butterflies. Big Bad: The unseen Skullasaurus, who pursues the group throughout the film or so it seems. Big Damn Movie: Oh yes! A grand adventure it is, one whose stakes and emotional power have yet to be matched by Pooh fiction to date. Big Good: Played for Drama and Deconstructed with Christopher Robin. As they're all his toys, Pooh and friends think the world of Christopher Robin and look to him for guidance and assistance. When they must go on a quest to save him, they slowly break down as they question their self-worth without Christopher Robin to help them. Big "WHAT?! ": When Piglet tells Christopher Robin that the Skullasaurus gobbled up Pooh, he responds with a shocked "Did what?" Bittersweet Ending: Even though the friends have found Christopher Robin and faced their flaws head on, Christopher Robin still won't be able to come and see them as much. But it's okay, since Pooh knows he always has Christopher in his heart, and they truly will always be together, forever and ever. Break the Cutie: Much like how Christopher Robin is being forced to grow up, the main group faces some challenges that test their faith and their psyches, and at the end of the second act they are broken by them. No one gets this worse than Pooh, who has a heartbreaking song lamenting how bad things have gotten for him without Christopher. Break the Haughty: Rabbit and Tigger are big victims of this as the story progresses. After Rabbit takes over Pooh as a leader to carry the map to find Christopher Robin after he grows frustrated at the former, his ego begins to inflate to a high level when they reach the mountainous regions when he sings the song, "If It Says So" which claims the map is the right answer to find the boy and it takes him a few minutes to deflate when he accidentally tears the map in half after it got snagged on the branch and blown away. Tigger, on the other hand, is boastful about his tail being powerful enough to help him bounce as he helps get the remaining part of the map which lands him on the log in the ravine as a bridge which he ends up breaking it making him realize his tail is weak and quickly breaks down as the log quickly shatters nearly killing him as he fells into the ravine. By-the-Book Cop: Once he takes charge, Rabbit orders the group to follow the map to the letter, singing a whole song about how they should trust the map, not their instincts. It's implied that Rabbit's lack of self-confidence has him using the map as a crutch to make himself feel better, since he has no idea which way he's leading the group. Chain of People: Let's see... Eeyore bites a root, Rabbit grabs his tail with one hand and Piglet's feet with the other, Piglet holds Pooh, and Pooh saves Tigger. They all dangle off the edge of a cliff until Eeyore says "ouch." Character Development: Most of the characters go through some sort of development by the end of the film. Rabbit learns that his own brain and ingenuity is what makes him the smart one of the gang, and that he doesn't have to rely on the written word - and that in the darkest times, he really is the best leader for the gang. Tigger learns how truly strong he is, not just in physical terms, but in personal terms when he decides he will try the impossible if only to save his friends. Piglet learns to overcome his fears, much like Tigger, to help his friends. Pooh and the entire gang overcome their dependence on Christopher Robin. Pooh in particular accepts that he may not be able to see the most important person in his life every day anymore, but that they'll always love and be with each other in their hearts - "forever and ever". Chromosome Casting: The entire cast is male, since Kanga (along with Roo and Gopher) is notably absent. The cover for the VHS and DVD don't convey that this is a Darker and Edgier film. The back covers, on the other hand, feature artwork that's considerably more solemn (see the page image for the VHS back cover) and foreboding (the gang of friends looking into the distance for the 2006 DVD), more appropriate to the film's tone. The Blu-Ray cover falls guilty of this by boasting a barely-modified version of a poster for the 2011 Winnie-the-Pooh movienote the same poster shown on that page, complete with the otherwise-absent Kanga and Roo. Credits Gag: "Winnie-the-Pooh ( And the Skullasaurus, too!)" Darker and Edgier: This film is a darker and edgier take on Pooh and friends, with some parts verging on downright scary as the characters leave the sanctuary of the Hundred-Acre-Wood and face perils of the outside world. The atmosphere is a lot heavier than any Pooh story to come before it, there's a lot of Paranoia Fuel, and the biggest threats to the characters turns out to be their own egos and vices. The film also sees the characters respond to what they believe is genuine death in a very mature way. Furthermore, it's an absolute Tear Jerker at some parts, even for a Disney film. Even the prologue is an ominous sign of things to come. We see a butterfly following a peaceful, meandering stream, only for the butterfly to react in shock when it sees the stream flow into a darker, scarier part of the river. Darkest Hour: The end of the second act. Owl's map is useless, Rabbit breaks down and admits they have been lost for hours, and the group realizes they are hopeless without Christopher Robin. To hammer it home, Pooh's faith in Christopher is shaken and nearly torn down. "End of the road... nothing to do... and no hope of things getting better. [Beat] Sounds like Saturday night at my house." Pooh has a few moments too, though that may be due more to his innocent nature. Death Seeker: Alarmingly, Tigger is willing to be abandoned to a fate of falling to his death after losing faith in his bouncing abilities. Luckily, his friends' valor in trying to save him brings him back. Disney Acid Sequence: Owl's song, "Adventure is a Wonderful Thing", in which he sings of the horrors awaiting the gang on their journey with gusto. Later, Rabbit's "If It Says So" has tinges of this, as massive signs begin to pop up everywhere during the song. Disney Death: Crossed with Dramatic Irony: the audience knows Pooh's alive, but Piglet, Tigger, Rabbit, and Eeyore don't. Dissonant Serenity: When the group first hears the Skullasaurus approaching, Piglet smiles nervously and simply asks "What was that?" Pooh's friends think the Skullasaurus killed him, but the audience knows Pooh is alive and well. Basically how the whole point of the film is set up. Owl believes Christopher Robin has gone to "Skull" when really the audience knows he's clearly spelling "School". Due to the Dead: When Pooh is believed to have been killed, the other four rise to the challenge and face their flaws that had previously crippled them head-on to reach Christopher Robin in Pooh's name. Earn Your Happy Ending: While it's a bittersweet ending, the cast still goes to hell and back to earn the "sweet" part. The Eeyore: Obviously. "Not much of a house. Just right for not much of a donkey." "It isn't mine. Then again, few things are." End of an Age: The basis for the entire plot is that Christopher Robin won't be able to spend as much time in the Hundred Acre Wood anymore, since he's started school. And eventually, though only implied in the film itself, there will come a time when Christopher Robin will be unable to see Pooh every day, as opposed to having spent the past several years in peaceful bliss in the Hundred Acre Wood. End-of-Series Awareness: The characters waving farewell to each other (and half of them waving at the camera) at the end of the film as they return home feel rather cathartic, almost as if they're waving goodbye to the audience after taking such a journey with them. Rabbit: "The Upside-Down Rock. If you've made it this far, you're (faltering) where... Monsters... Are." Fatal Flaw: Piglet's crippling fear, Tigger's overconfident strength, Rabbit's by-the-book knowledge, and Pooh's faith in Christopher Robin are all exposed, picked apart, and exploited (except for Eeyore). It's the first Winnie the Pooh movie that could also double as a convincing character study. Flat "What. ": When Owl dramatically announces that Christopher Robin has gone to Skull, Pooh has a very flat, unimpressed "Skull??" for him before asking him to clarify. Fleeting Demographic Rule: The storyline is reused in the 2011 movie Winnie-the-Pooh. Once again, Owl misreads a note Christopher Roblin left while he's at school, and assumes he's been kidnapped by a fantastical monster. This time it's mistaking "be back soon" for "The Backson." He even sings another acid trip song about it as he sends the others on their journey. Foreshadowing: The most obvious examples can be found in Fatal Flaw above, but a more subtle one can be found while the troupe are traveling through Skull: at one point, they encounter a giant wall of crystals that distorts Pooh's image so much that they mistake it for the Skullasaurus, hinting at the monster's true nature (its hellish call is actually Pooh's stomach growling) and that everything isn't quite as it seems. Pooh: Perhaps we should... split up? Rabbit: Why Pooh Bear! I believe that's a very smart idea! When the log Tigger is bouncing on collapses, he has time to look at the audience in horror as his tail starts to fall first, then his body, then finally his head. Turns into a Mind Screw when you consider that, later in that very scene, another log collapses beneath him, and gravity affects him the way it would in the real world: immediately. When Eeyore lets go of the root preventing the gang from falling into a pit, he has time to say, "I said, 'Ouch'." before gravity comes into play. Subverted during Tigger's bounce to end all bounces. He sends himself flying up into the air but falls just short of his goal. He falls a few feet out of the frame... only to suddenly reappear onscreen "swimming" upwards through the air to make the last few feet to his goal. Growling Gut: The terrifying roars of the Skullasaurus turn out to be nothing more than Pooh's "rumbly tumbly", as he hadn't eaten any of the honey Christopher Robin gave him. Heroic BSoD: See Fatal Flaw above. This trope is evoked when they collectively come to the assumption that they simply aren't strong, smart, or brave enough to save their friend... since Christopher Robin was the one who'd always come through for them. 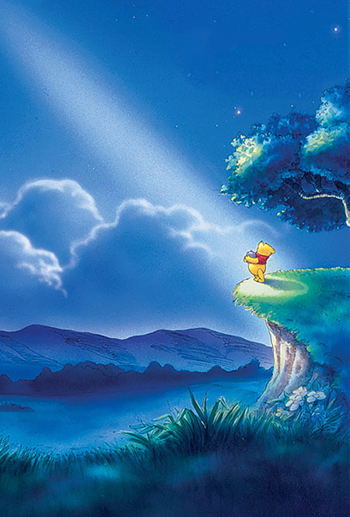 Innocence Lost: Of all characters, Pooh, among the most innocent characters in fiction, has a moment of this when he acknowledges in song that he "used to believe in forever" but has now been made to understand that "forever's too good to be true." Insufferable Genius: Subverted; Rabbit is the smartest guy in Pooh's group but isn't aware of it, his "insufferable" part is when he takes over Pooh as the leader earning him Owl's deciphered map to read which he constantly tells everyone to follow it better than his own mind which will bite him psychologically later on but eventually learns from his mistake that even the map is useless and proclaims to use his brain to help everyone work together to 'save' Christopher Robin. It Was with You All Along: The ending of the movie reveals that everything the cast had searched for, they had all along. Piglet was always a very brave little guy, proven by when he immediately threw himself off a cliff to rescue Pooh and Tigger. Rabbit was always very smart, and never needed a map to effectively lead the group. Tigger always was extremely strong, if not physically then emotionally. And Pooh learns that Christopher Robin was and will always be with him in his heart. Eeyore sums it up best. Eeyore: Didn't need to come all the way out here to find it. Always had it with us all along. Knight of Cerebus: Arguably Owl, as the movie becomes Darker and Edgier during his first scene. Also counts as a Meta Example, as it was his map and sway over the group's imagination that made the events and locations they encounter so scary in the first place. Once Christopher Robin is found, the group discovers to their shock that Skull and the rest of the Great Unknown are no scarier than the rest of the Hundred Acre Wood. The Leader: Pooh is initially this, as he is the one who first brings the team together. However, being a bear of very little brain, Rabbit takes over after he gets them nowhere during the first Skullasaurus "attack". At the end of the second act, during the group's Heroic BSoD, Rabbit gives up his title after making a ton of bad choices and getting them lost. Then Pooh briefly starts making the decisions, but when he is separated from them, and the map proves useless, Rabbit finally becomes an accomplished leader when trying to get to the Eye of Skull. It seems that while Pooh has some leadership abilities, Rabbit when on top of his game is the best one to lead the group. Let's Split Up, Gang: Played straight, to increase the search area. Manual Misprint: The VHS version uses the Walt Disney Masterpiece Collection logo. Meta Guy: Owl knows all about the various perils of an epic fantasy quest, and thus is the one who sends the gang out on their journey. Once the gang overcomes their fears, they find that all the things he dreamt up as part of their quest were all false, and they dissolve alongside the conflict of the film. My Greatest Failure: Tigger being unable to bounce out of the gorge, and subsequently bringing his friends down with him; Piglet being unable to save himself from a swarm of butterflies; and Rabbit getting the group lost. Pooh and Christopher Robin's discussion about doing "nothing" is reprised for the opening of this film. Tigger tears into some honey, but remembers from The Blustery Day that "Tiggers don't like hunny!" The end of the film hearkens back to more classic dialogue from the two's farewell in both the original books and the epilogue of The Many Adventures of Winnie the Pooh. Never Say "Die": "The Skullasaurus...it got Pooh." No Antagonist: Revealed only at the end of the film, as there was no Skullasaurus and the main obstacle of the entire movie was actually the characters overcoming their fears and Pooh realizing the true depth of his relationship with Christopher Robin. No Sense of Direction: Played for laughs and straight; After Pooh's trusted with the map deciphered by Owl. He and his friends set off to search for Christopher Robin and as they heard the 'Skullasaurus' roar after they passed the woods. Pooh tries to ease the situation when everyone immediately panics by reading the map and pointing in every direction to run away from it together but it's clear that Pooh is illiterate which is his main flaw in being a leader and Rabbit begins to be aware of it, angrily loses patience with him and assumes his unofficial leadership by snatching the map from Pooh. Tigger: Don't worry, Piglet ol' pal. There's no difference between falling a thousand feet to the jagged rocks below and tumbling out of bed. Tigger: Sure. [Beat] Um...Except for the splat at the end they're practically similar. Nothing Is Scarier: None of the characters ever actually see the Skullasaurus (because it doesn't exist), but that's part of what makes it so scary to them. In particular, the first encounter with the beast has the group look up in horror as the roars of the Skullasaurus' roars echo through the woods they just emerged from, initially completely devoid of score. There's one point where they do believe they've finally seen it, but it's actually a distortion of Pooh's reflection in the crystals within the Skull cave. This turns out to be Foreshadowing, as the Skullasaurus' roars they'd been hearing the whole time was actually the sound of Pooh's stomach getting hungrier, so in a sense, Pooh was the Skullasaurus all along. Not So Stoic: Eeyore spends most of the film being... well, the Eeyore, but he is genuinely horrified when Piglet leaps to save Pooh from falling into the gorge. Later, Eeyore screams for his life like he'd never done before when a bridge breaks under him in Skull. Oblivious Guilt Slinging: At the start of the film, Christopher Robin's attempts to tell Pooh that he will not be seeing him tomorrow are not helped at all by Pooh repeatedly stating how he's glad they're meant to be together "forever and ever." Oh, Crap! : Many examples, but probably the biggest example is Eeyore after realizing he just let go and caused them all to plummet into the gorge. When Pooh is about to plummet into the gorge with Tigger, Piglet immediately leaps into peril to save him without a moment's hesitation, only a completely serious and grave expression on his face. Eeyore and Rabbit follow suit, completely shocked and terrified by Piglet's act of bravery. The group as a whole is this when they realize they don't have what it takes to find Christopher, let alone go home. Tigger: Let's face it. Without Christopher Robin, we don't stand a chance of finding Christopher Robin. Once More, with Clarity! : After finding Christopher Robin, the gang realize that everything was only as scary as it was because they believed it to be, and the end musical number shows that the gorge was a tiny dip and the carnivorous plants were merely thorny. Out of Focus: Eeyore does not have a character arc like the other four members of the group, and doesn't contribute much, but is still included as he's one of the franchise's core characters. He does provide some of the film's funniest moments regardless. Poor Communication Kills: The gang needlessly went on an epic quest to save Christopher Robin just because some honey blurred the note he left. Owl's rather sub-par spelling skills don't help matters. The grand adventure doesn't stop Christopher Robin from having to go to school and not see them as much anymore. Eeyore nails it on the head when the gang hesitates to enter Skull, citing that they don't know what they'll find. Eeyore: But we know what's gonna find us! Reality Is Unrealistic: Again, the film shows the first day of school happening on the first day of autumn, and the leaves instantly change color and start to drop overnight. In many real-life cases, public schools usually start anywhere from mid-August to mid-September, when it's still technically summer and the leaves are still green (for the most part), as the first day of autumn is really September 22nd. Red Herring: When the gang is dangling from the cliff, Eeyore's tail (which Rabbit and by extension the other four are holding onto) begins to stretch, and it looks like the classic gag of Eeyore losing his tail will send the gang hurtling down. Instead, Eeyore, having been holding on by biting a root, opens his mouth and clarifies to Tigger that he said "Ouch". Then they fall. Rule of Symbolism: Quite a few. Pooh's honey pot is a physical representation of his initial belief that he is apart from Christopher Robin completely when they are not physically together. He clings to it throughout the movie, and even sadly looks into his reflection in the honey inside during "Wherever You Are". When he finally realizes that Christopher is always with him, he takes one last look into the pot to realize the truth, and ultimately abandons the pot forever when Christopher Robin rescues him from the pit. The map is a representation of Rabbit's lack of confidence in his own mind. He orders the gang to follow it and him without question. He views it as a crutch to lean on so he doesn't have to try to come up with something on his own. At the end of his song about the map, the thing ends up ripping in half and becomes more and more useless until the gang reaches the Eye of Skull. Tattered and crumpled, Rabbit finally realizes it's useless and discards it, finally using his own brain to lead the team. Piglet climbing the tree at the film's beginning represents his own demeanor. Climbing the stories-high tree proves that Piglet is capable of great acts of bravery, but when one little branch he's on snaps, he completely crumples. Once he gets the confidence boost he needs, he overcomes his fears and climbs the tree at the film's end with no problem. Tigger's tail apparently not giving him enough bounce to grab Piglet in the opening scenes symbolizes his inner self-doubt about his abilities ultimately causing him to shut down. Later, in the gorge, this is exactly what happens: Tigger loses faith in his tail and ends up completely shutting down. Christopher Robin tenderly places two fireflies into a sleepy Pooh's hands, and the two seem to become one - representing how the two are always together. Sacrificial Lion: Pooh's Disney Death is what convinces the others to finally rise above their insecurities and make the final push to save Christopher Robin. Sanity Slippage: Played for Laughs when discussed by Tigger. Piglet offers to be Pooh's new "best-best-friend" in the wake of Christopher Robin's absence. Pooh declines, since only he and Christopher Robin can do "nothing." Tigger muses to Eeyore that Pooh's apparently losing what little brain he had. Scare Chord: When Pooh spots the Upside-Down Rock. The movie could easily serve as the true end to Disney's Winnie-the-Pooh fiction. It tackles the ramifications of the ending of the original books head on, having Pooh and Christopher Robin make peace with the fact that they'll always be together, and the cast overcoming their major flaws they're always portrayed with. While of course the franchise continued, this film could easily serve as the endgame of the stories of the Hundred-Acre Wood. Some fans at the least consider the film to be the Grand Finale of The New Adventures of Winnie the Pooh, given the fact it had the same animation and story crew (and therefore the same animation and art style), the same voice cast (except for Owl and Christopher Robin), and that it was the first Disney Winnie the Pooh adaptation made since said show ended. Skeleton Motif: After the gang deciphers Christopher Robin's letter, they become convinced that he's been kidnapped by a monstrous "Skullosaurus" and taken away to a place known as "the Skull". This is represented by a giant skull symbol on Owl's map, and turns out to be a cave bearing a suspicious resemblance to a cranium once the gang actually gets there. In the end, it turns out that they had just misread a message saying Christopher Robin was off to school, and their fear made the cave appear a lot more monstrous than it really was. Soundtrack Dissonance: Even with the film's darker, more mature tone and scope, the credits version of "Wherever You Are" wouldn't sound out of place at the end of a drama like fellow 90's film Ghost. Tempting Fate: "Forever and Ever" is full of it, as Pooh's worst fears come true the very next day. Pooh: I wanna call your name forever/And you will always answer forever/And both of us will be/Forever you and me/Forever and ever. The Quest: Played straight; they even have a parchment map! The Hero: Pooh, though Rabbit is The Leader. The Lancer: Tigger, who is a foil to Rabbit. The Big Guy: Eeyore, and Tigger in the climax. The Smart Guy: Rabbit, who in a unique example of this trope is also The Leader of the group thanks to his brains. Those Two Guys: Piglet and Eeyore are often seen together, though mostly during the latter parts of the film. Through the Eyes of Madness: Once Christopher Robin is found, Pooh and the gang exit the cave and to their surprise, the cave looks smaller and less scary than before when they entered. Christopher Robin points out to them, "Well, things can seem that way when we're alone, or afraid, or someone's hurt." As they are heading home during the "Everything Is Right" sequence, we get to see how several of the other scary things they passed really looked like. And before all this, all the growling that was thought to be the Skullasaurus was really the growling of Pooh's tummy. Too Good to Be True: As said in his song, Pooh honestly believed that no matter what, Christopher Robin would always be by his side and that they would always play together "forever and ever". When this is found not to be the case however, Pooh utters this trope in a song, sounding heartbroken on top of that. Indeed, this realization is quite a devastating blow to the stuffed bear. Took a Level in Kindness: Rabbit is more of a control freak than a jerk in this film, but he softens considerably after he breaks down once he gets the group lost. No better shown when he gives the map to a sleeping, hurt Pooh to keep warm in the middle of the night. The Very Definitely Final Dungeon: Skull. It is dark, ominous and eerie, and the lair of the Skullasaurus, which has been hunting the group the entire film. Uncle Sam Wants You: During "Adventure Is A Wonderful Thing", Owl takes the place of Uncle Sam with his Tagline being "We want you" when trying to rally the gang's spirits. Unexpectedly Dark Episode: The typical Wacky Hijinks of the characters in the Hundred Acre Wood where the biggest danger to be found was bad weather and annoying pests gives way to a perilous journey from their homes to the "great unknown" in search of Christopher Robin, where Pooh and the others face their respective character flaws head on and at several points are very nearly overcome by them. To say nothing of them all thinking that Pooh has been killed at one point. Tropes Are Not Bad, though. Vitriolic Best Buds: Tigger and Rabbit as usual. In this film they come to rely on each other's leadership and strength, even after their typical banter and repartee. Walk Into Camera Obstruction: Twice. With Eeyore, when he's falling after a bridge he was walking on collapses. And again with Tigger where he and Eeyore run into Rabbit. Wrong Genre Savvy: Owl seems to think he's making a map for a dark, epic fantasy film, not a Winnie the Pooh film. This is a part of his Knight of Cerebus status; it's his map and romantic ideas of adventure that make the journey so dark, when nothing is really as scary as it seems. And even then, his map is wildly inaccurate to the world he was trying to map out. You Are Better Than You Think You Are: The basis of the Arc Words above. And wonder if you're dreaming too..